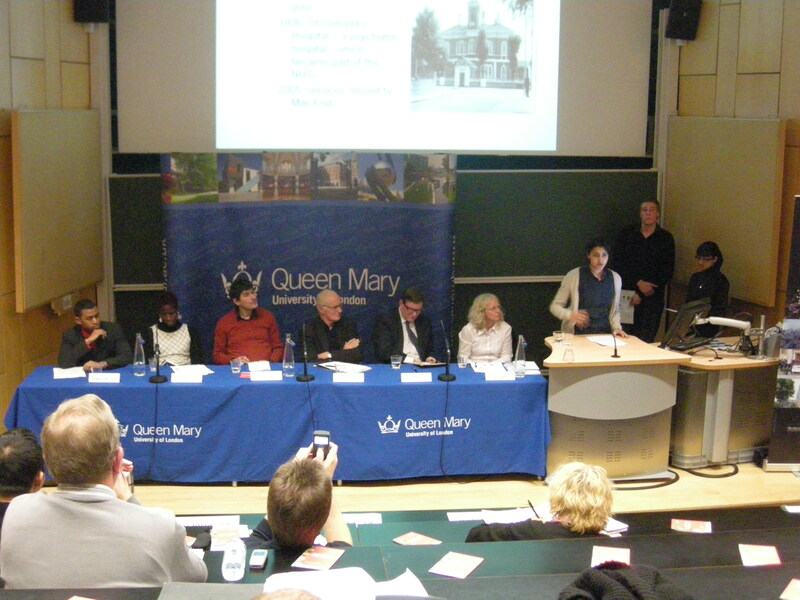 Wow, that was quite some presentation yesterday evening at Queen Mary’s University of London. It was the fourth and last of a series of presentations by the Olympic Park Legacy Company and the Legacy Now team. They welcomed questions from the audience at the end of the presentation, but to call it a consultation would be a misnomer. I had attended the first of the four talks at the London School of Economics on 10 November. The big leaders were present for that one including the Chief Executive of OPLC, Andrew Altman, the American planner who was responsible for leading and effecting significant change and regeneration of the Anacostia River waterside in Washington, D.C. Over the course of the last month, I have been to several presentations and consultations about the legacy park, what will result from the Olympic Park site post-2012 games. I am sometimes optimistic about aims and ambitions of the Olympic Delivery Authority, which is presently land-owner and developer of the site. On the one hand, the Olympics are a great catalyst for change in the Lower Lea Valley area, without a doubt. The land straddles four boroughs – Tower Hamlets, where I live, Newham, Hackney, and Waltham Forest. Without the singular goal of Olympics, there was less incentive for the four boroughs to work together and communicate a cohesive plan. The site itself was a developers’ nightmare with derelict waterways, electricity pylons, and railway lines intersecting and interrupting the landscape. Historically, an industrial-intensive site, it lacked adequate transport and pedestrian links and basic infrastructure to allow it to be a livable community space. The Olympic development has changed all that. Mind you, it is taxpayers’ money that has been poured into infrastructure – the electricity pylons have been buried underground, the canal system is being cleaned up, new roads and bridges are being installed to connect it to the surrounding neighbourhoods. The ODA is mindful that what remains post-games – the legacy park – is rightfully and sympathetically returned to the public. Last night’s talk was sympathetically titled the People’s Legacy. But this is easier said than done. I have decided to stay as positive as possible in this post, although I will say one thing – fortunately the talk ended on a high with meaning and real practical words. It didn’t start off that way. The panel was diverse including representatives from the OPLC, London Citizens, Fundamental, students from the Department of Geography at Queen Mary, University of London, Bob Colenutt (head of research at the Northampton Institute for Urban Affairs), and Lord Andrew Mawson (social entrepreneur and founder of the Bromley by Bow Centre). The evening opened with presentations about how members of the surrounding community, in particular young people, had been engaged in projects related to the Olympic development. This included architectural projects for youths leading up to the Olympic bid, manifestos developed by students from local schools, and a set of ethical guarantees that were submitted to the International Olympic Committee for inclusion in the 2012 bid. The presenters were enthusiastic and marketed the plans and activities well. Where it fell short was in providing evidence of the impact of these efforts, especially the ethical guarantees. I wondered how much of these ideas had actually been implemented. I only heard them say that things were going well and that there were regular meetings to measure progress. But where is the hard evidence that the ethical guarantees are or will be honoured? And then the presentation got really interesting. Andrew Mawson provided examples of how he and his organisations have made a difference. He emphasised the need to get into the nuts and bolts of projects and to pay attention to the detail. His philosophy was about doing, not just planning and talking and he proved this through anecdotal examples of using redundant church space for other business uses such as a dance school, an integrated nursery, and a gallery. This was the foundation for the Bromley-by-Bow Centre which boasts an health care unit, social enterprise hub, and advice for small businesses. Lord Mawson was not only promoting the idea that by getting involved practically and building stuff, we would effect change, he was able to showed that this worked from his own personal experience and hard work with sleeves rolled up. The final speaker was Bob Colenutt from the Northampton Institute for Urban Affairs who was blunt and frank with his comparison of the Olympic Park opportunity with the of the London Docklands Development Corporation, which had been responsible for regenerating and redeveloping the Isle of Dogs and Royal Docks near the City Airport and Excel Centre. Again, using examples that were supported by visible evidence, what was promoted as a once in a lifetime opportunity for real economic change in East London had failed miserably to provide jobs, improvement, and sustainable wealth for the local community. It was the property investors and City and West End uses that benefited. The divide on the Isle of Dogs is evident with affluent riverside apartment buildings around the perimeter and council estates squeezed down the middle. The Dockland Highway makes a clear definition between the financial power of Canary Wharf to the south and the deprivation of Poplar to the north. He stated something obvious, but that seemed to have fallen on deaf ears in the past decade – the redevelopment of the Docklands was property-led rather than people-led and the Olympic Park is at risk of the same issue. He cited Coin Street, one of my favourite examples, as one model of community-led building where the community rallied together, fought for just development, and the land was acquired for £1. A similar approach is being proposed for the St. Clement’s Hospital site on Bow Road as a predecessor to the legacy park in the form of a Community Land Trust, in an attempt to transfer land ownership to the community at existing use or affordable use values. This is what we need in order to build sustainable communities – real action and people-led development – and I find inspiration in Lord Mawson’s and Bob Colenutt’s presentations. I will shortly be doing something very real and people-led. I’ll be starting small and taking Lord Mawson’s advice of making one thing work first. Watch this space – I might be needing your help in the future to make it a success. In the meantime – were you at last night’s talk? Were you at any of the other Olympic Park Legacy Company and Legacy Now talks at the London School of Economics, University College London, or Goldsmiths? I’d like to hear from you. Please leave me a comment – it’s with your comments and feedback that I can help do better in the community. Thanks.